Holiday traditions. We all have them. Or at least want them…. Meet the Elf on the Shelf. He’s a cute elf, dressed in red, who comes out on December 1st. Each night he moves to different spots in your home, to keep watch over all the girls and boys. It’s an ADORABLE tradition that I fell in love with about three years ago when I was nannying for a family. I had never heard of ‘Shelf Elf.’ The mother explained to me that each night, she moves him to different parts of the house for her children to find. He’s Santa’s little helper! I loved the idea so much that I went out and bought one to save for when I have my own family. Such a clever idea. Who knew it would be so popular just years later? Searching Pinterest one evening, I came across some lovely ideas to keep your kids entertained as the December month rolls on. I love the idea of him making a snow angel out of sugar! Too freakin’ cute! 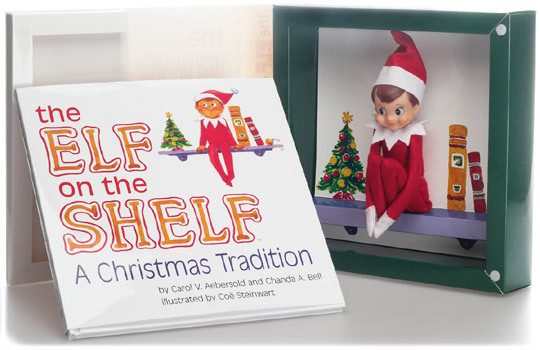 Does your family have a Shelf Elf? What special places does he hide? Hi! We’re new to Elf on the Shelf with our kiddos this year. Super cute, border line creepy, but fun! My 7-year old left candy next to it last night and when she woke up this morning it was empty. She loved it. My 3-year old doesn’t get it and just keeps saying he’s “scared of Santa.” Your blog is great, especially love the photos!! Keep it up!! Merry Christmas!